They’re a generous bunch over at BetFair Casino. 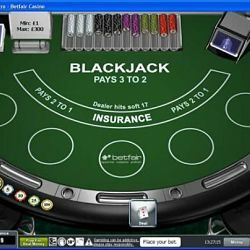 Thanks to the casino’s latest promotion, you will receive a free £5 in bonus money every time you play Blackjack. Whether you’re an expert Blackjack player or fancy trying it out for the first time, you’re welcome to try your luck at BetFair and enjoy your bonus prize while you’re at it. BetFair have a massive £10,000 prize pool to dish out as part of this promotion. That means that you can keep on receiving £5 bonuses every time you deposit until this stash of cash runs out. So what are you waiting for? Start playing today to get as much of that £10K as you can. To take part in this promo and claim your free fiver, all you have to do is play at one of BetFair’s Live Casino Blackjack tables between now and January 12th and get a hand of Blackjack. Every time you play a hand of Blackjack you will receive £5 in bonus funds until the prize pool runs out or until the promotion ends- whichever comes first. Each player is eligible to receive a maximum of five bonuses a day. The Blackjack bonus promotion is open five times a day per customer. That means five times daily per household, family, IP address, email address and bank account. There is a 10X wagering requirement attached to any cash won with the £5 bonus. If you trigger any other BetFair promotions while the Blackjack offer is active, the other bonus(es) will become queued in the bonus balance of your account. The other bonuses will only become active once this promotion has been played through.